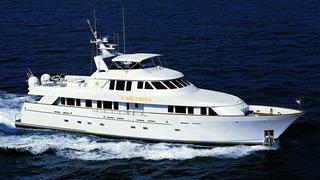 A call to Jim McConville at Allied Marine confirms a $401,000 price drop on his central listing, the 37.8m motor yacht Casuarina. Built by Delta Marine in 1998 and previously known as Scott Free and Mimi, she was recently treated to new carpets, flat screen televisions, DVD players and iPod docking stations throughout. A maple wood interior accommodates eight guests in a master suite, VIP stateroom and two identical double cabins while twin 1450hp Detroit Diesel engines give her a cruising speed of 15 knots. Casuarina is now down from $7.4 million to $6,999,000.